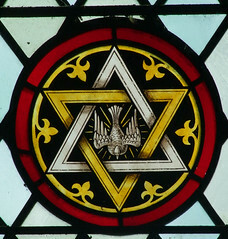 In the summer of 2016 I decided to try and revisit all the East Anglian churches I'd not been to since buying my first digital camera back in 2003, and Shadingfield was high on my list. I took the train up to Brampton station. Brampton is a request stop on the rambling East Suffolk Line which, in no particular hurry, joins Ipswich to Lowestoft through a succession of small east Suffolk market towns. I think it is safe to say that Brampton is the most remote stop on the line, two miles from the village whose name it takes, and with just a couple of houses for company. It is actually much closer to the village of Redisham, but I'm told that the Victorians named their stations after the nearest post office. I was once told by one of the cheery ticket clerks at Ipswich station that I was the only person to whom he'd ever sold a ticket to Brampton. If you decide to go there yourself, make sure you don't accidentally buy a ticket to Brampton in Cumbria by mistake. Shadingfield is also a couple of miles from Brampton station, and it is one of those quiet little places you often find lost in the lanes of north-east Suffolk. The energetic antiquarian David Elisha Davey was a regular visitor in the 1820s and 1830s, always spelling it 'Shaddingfield' in his journals, which remains the modern pronunciation. The population of the parish reached a peak of 220 in the 1851 census, of whom almost a half were attending the church on a Sunday, a spectacularly high proportion for east Suffolk. St John the Baptist stands above the road between Beccles and the A12. The tower is 15th century, later patched in red-brick on the north and west sides, which lends it an endearingly homely quality. Below it on the south side of the nave is one of those pretty red-brick porches you frequently find in Suffolk. A Tudor design of this kind is usually thought of as being early 16th century, but the image niche is surprisingly small, and may not even be for images, and so I wondered if the structure might actually post-date the Reformation. 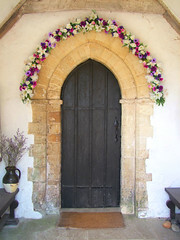 It conceals an attractive late 12th Century doorway. 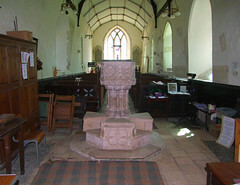 The font stands on a high platform in the shape of a Maltese cross as at nearby Weston and, further afield, at Laxfield. I'm told that baptising babies in these fonts can be a precipitous affair. 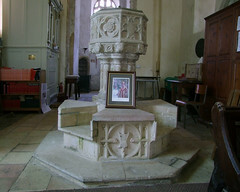 The font itself is late medieval, its panels with shields in quatrefoils seeming to match those on the base, suggesting that they were made for each other. 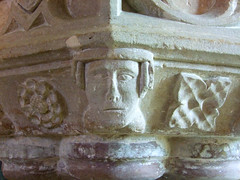 The little heads that peep out from the corners are delightful. 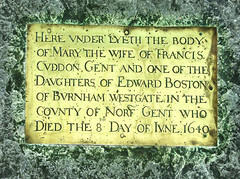 It is probably earlier than the Weston and Laxfield platforms, both of which support seven sacrament fonts, so it may have provided a model for them. 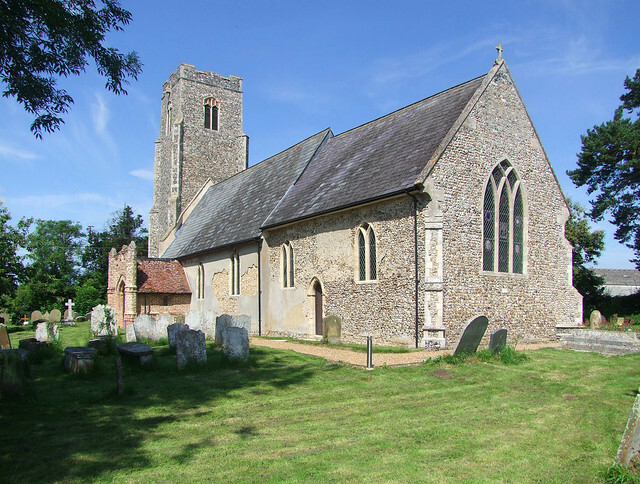 As with many churches in north-east Suffolk, the unaisled nave and chancel here run into each other with nothing to mark their division - or, at least, almost nothing. 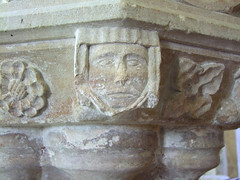 For here, although the roodscreen has long gone, there are two extraordinary corbels set in the north and south walls, that once supported the roodloft. 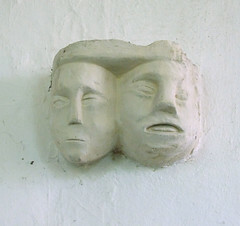 The one to the south is formed of a head, that on the north side of a pair of heads pressed together, apparently showing us that two heads are better than one. 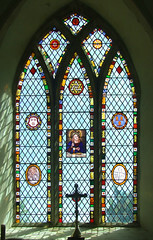 The east window contains panels of English and continental glass. 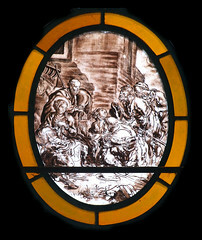 The roundels of the Adoration of the Shepherds and the very faded Ascension are both Flemish, I think, but the panel of Christ blessing bread and wine, probably from an Emmaus scene, is likely to be English, perhaps by a local workshop of the early 19th Century. 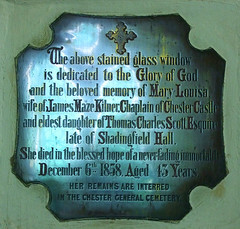 In the north wall, there is a lancet containing unusual and beautiful enamelled glass, a memorial to Mary Kilner who died in 1858, a delicious High Victorian moment. 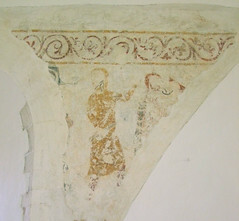 There are fragments of a surviving wall painting scheme in the nave. 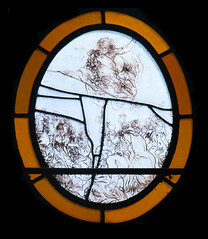 That on the north wall appears to be a Passion sequence - you can still make out the panel of Christ being whipped. 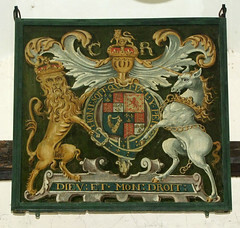 Elsewhere in the nave, there's a good set of Charles I royal arms, and that curiosity of this part of the county, a banner stave locker. 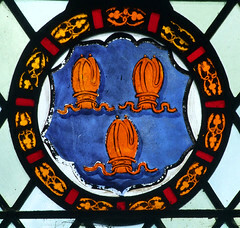 There are twelve churches in the Lowestoft area that have them, and their use appears to be for containing the wooden poles used to carry images and crucifixes in medieval processions. Fair enough - but why only around here? 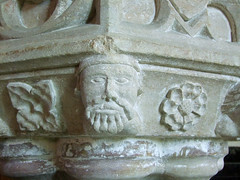 Did other medieval churches possess wooden cupboards? So why have none survived? Perhaps its just a Lowestoft area thing, the need to tidy bits away. 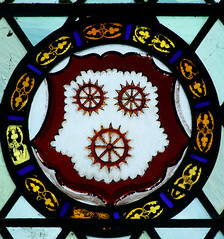 This parish is famous for the Shadingfield altar cloth, a rare and unusual lace-trimmed textile that was given to the church in 1632. This was at the time when Archbishop Laud was trying to reintroduce sacramental practices back into the Church of England, including the re-establishment of altars in chancels. 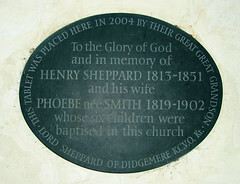 The move fell to the fury of the puritans; Laud was executed, the altars were removed, and the pulpit became the main focus of Anglican worship for the next 200 years. 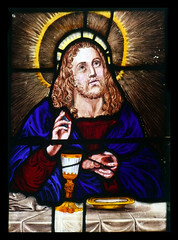 The altar cloth itself is now on view in Strangers' Hall Museum in Norwich.